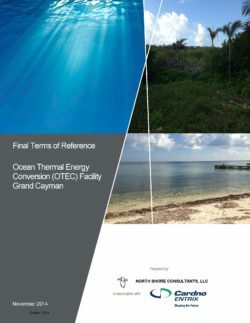 OTEC International LLC is undertaking an Environmental Impact Assessment (EIA) for its planned installation of 25 megawatts (MWe) of phased Ocean Thermal Energy Conversion (OTEC) development to be located adjacent to the north coast of Grand Cayman (GC). OTI proposes that the first phase would be 6.25MW on a floating power platform. An Environmental Assessment Board (EAB) was convened from within government and statutory authorities to assist the Cayman Islands Government (CIG) in its evaluation of the environmental effects and mitigating provisions to be incorporated into the OTI design. Terms of Reference for the EIA were finalised in November 2014 and can be found below.